Otsego, Minn., Oct. 8, 2018 - Crestliner is proud to award four scholarships as part of its new Angling Aces Student Program. The program, which launched in March of this year, awarded two individual scholarships and two team scholarships, totaling $6,000. "One of the main components of the Angling Aces program is to support young anglers who would like to pursue professional fishing, as well as young angling student teams," said Lori Kneeland, director of marketing. "It's our honor to be able to give to the future leaders of this sport." Pennsylvania College of Technology, Montoursville, Pa. In addition to awarding scholarships, the Angling Aces program aims to help student anglers perfect fishing techniques, advocates for the outdoors and resource conservation, and teaches on-water safety. "This program is a true joy for us as a company," Kneeland said. "We're happy to not only support these promising young anglers, but also to bolster the sport of fishing. We look forward to many more opportunities to award scholarships and offer support through Angling Aces." Crestliner is now accepting applications for 2019 scholarships. 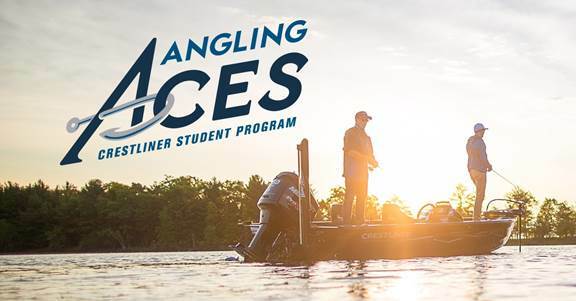 To sign up for the program and receive news updates, students can visit Crestliner Angling Aces and follow us on Facebook at Crestliner Angling Aces.